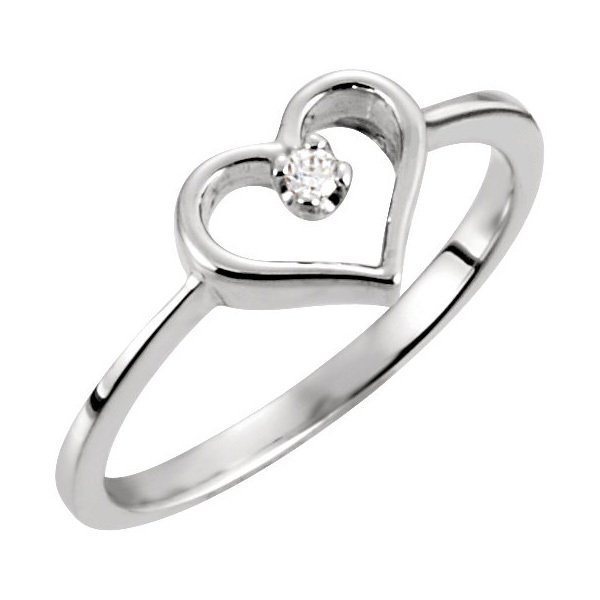 Created with plenty of love in mind, this diamond solitaire heart ring in white gold from Apples of Gold Jewelry is sure to make you smile each time you slip it on your finger! Available in your choice of either 10K, 14K, or 18K white gold, this beautiful ring offers a sweet heart shape with a cut out design, with a beautiful solitaire diamond in the center. The diamond is 0.025 carats total weight, and is rated G-H for color and I1 for clarity. This stunning ring is sure to become an instant favorite, and the thin and comfortable band allows it to be paired with other rings or worn alone. We guarantee our Diamond Solitaire Heart Ring in White Gold to be high quality, authentic jewelry, as described above.